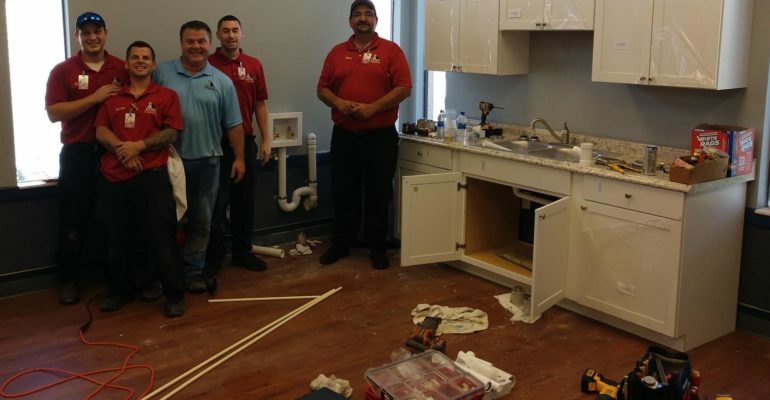 Aztec Plumbing and Lowe’s Home Improvement have donated plumbing and construction services and materials for Lee Association for Remarkable Citizens’ (LARC’s) new Lab for Living. Learn, Achieve, Become (LAB) is an experiential learning environment located on LARC’s main campus in Fort Myers that transforms traditional program areas into spaces for innovation, vocation, demonstration and learning. LAB layers 5 experiential learning Labs and embraces a holistic strategy as a framework through which people with intellectual and developmental disabilities maximize independence and employment success. The five Labs will focus on skills for work, residency and leisure. The Lab for Living is the first of the Labs and is an apartment-style setting that will provide participants with hands-on training in daily living skills. The Lab will include a bedroom area, living and dining areas, a kitchen and laundry facilities. Daily living skills will include cooking, home management, housekeeping, laundry, menu planning, shopping, fire safety, home safety and much more. Lowe’s Home Improvement (Lowe’s Heroes) donated and installed the cabinets and appliances, painted the room and installed the flooring. Four local Lowe’s stores adopted LARC for additional projects including interior and exterior renovations and improvements to LARC’s Cape Coral and North Fort Myers group homes and Bonita Springs Adult Day Training Program.